Tartu ([ˈtɑrtˑu], South Estonian: Tarto) is the second largest city of Estonia, after Estonia's political and financial capital Tallinn. Tartu is often considered the intellectual centre of the country, especially since it is home to the nation's oldest and most renowned university, the University of Tartu. The city also houses the Supreme Court of Estonia, the Ministry of Education and Research and the new impressive building of the Estonian National Museum opened to public on October 2016. Since 1918, the Estonian name Tartu has been used, but as the town has come under control of various rulers throughout its history, there have been various names for it in different languages. Most of them derive ultimately from the earliest attested form, the Estonian Tarbatu. In German, Swedish and Polish the town has been known and is sometimes still referred to as Dorpat , a variant of Tarbatu. In Russian, the city has been known as Юрьев (Yur′yev, after Yuri, the baptismal name of Grand Prince Yaroslav I the Wise) and as Дерпт (Derpt, from the Low German variant of Dorpat). Similarly, the city has been known as Tērbata in Latvian, while Finnish-speakers use the toponym Tartto. The first documented record of the area was made in 1030 by chroniclers of Kievan Rus. Yaroslav I the Wise, Prince of Kiev, invaded the region that year, built his own fort there, and named it Yuryev (literally "Yury's" – Yury (a Russified form of George) being Yaroslav's Christian name). Kievan rulers then collected tribute from the surrounding ancient Estonian county of Ugaunia, possibly until 1061, when, according to chronicles, Yuryev was burned down by Estonian tribe called Sosols. Kievan Rus' again controlled Tartu from 1133 for an unknown period, possibly up to 1176/1177. In the 12th century Tartu was the most notable Slavic settlement in Chud territory. Estonian amateur historian Enn Haabsaar speculates that the "Yuryev" mentioned in this context is actually Bila Tserkva, Ukraine, a town that was also founded by Yaroslav I the Wise as Yuriev about the same time, 1032. His views have been criticized by historian Ain Mäesalu. During the period of Northern Crusades in the beginning of the 13th century the fort of Tarbatu (or Tharbata, Tartu) was captured by the crusading Livonian Knights — also known as the Brothers of the Sword (German: Schwertbrüder) — and recaptured by Estonians on several occasions. In 1224, after Ugaunia had recognized the supremacy of Novgorod and Pskov princes who sent additional troops led by prince Vyachko of Kukenois to the fort, it was besieged and conquered for one last time by the German crusaders. Subsequently, known as Dorpat (Latin: Tarbatum), Tartu became a commercial centre of considerable importance during the later Middle Ages and the capital of the semi-independent Bishopric of Dorpat. In 1262 the army of Prince Dmitri of Pereslavl, son of Alexander Nevsky launched an assault on Dorpat, capturing and destroying the town. His troops did not manage to capture the bishop's fortress on Toome Hill. The event was recorded both in German and Old East Slavic chronicles, which also provided the first record of a settlement of German merchants and artisans which had arisen alongside the bishop's fortress. In 1558, tsar Ivan the Terrible invaded Tartu beginning the Livonian War. Dorpat was captured without a fight and the local bishop was imprisoned in Moscow, which effectively ended the period of local self-government. In the effect of the Truce of Jam Zapolski of 1582 the city along with southern regions of Livonian Confederation became part of the Polish–Lithuanian Commonwealth. In 1598 it became the capital of the Dorpat Voivodeship of the Duchy of Livonia. A Jesuit grammar school "Gymnasium Dorpatense" was established in 1583. In addition, a translators' seminary was organized in Tartu and the city received its red and white flag from the Polish king Stephen Báthory. With the Treaty of Nystad in 1721, the city became part of the Russian Empire and was known as Derpt. Fires in the 18th century destroyed much of the medieval architecture, the Great Fire of Tartu in 1775 removed most of the buildings in the centre. The city was rebuilt along Late Baroque and Neoclassical lines including the Tartu Town Hall which was built between 1782 and 1789. During the second half of the 19th century, Tartu was the cultural centre for Estonians in the era of Romantic nationalism. The city hosted Estonia's first song festival in 1869. Vanemuine, the first national theatre, was established in 1870. Tartu was also the setting for the foundation of the Society of Estonian Writers in 1872. Tartu railway station was opened in 1876 when Tapa–Tartu route was built. The station building was opened in 1877. In 1893, the city was officially retitled to the ancient Russian name Yuryev. The university was subsequently russified from 1895 on with the introduction of compulsory Russian in teaching. Much of the university property was relocated to Voronezh in 1918 and during the German occupation the University worked under the name Landesuniversität Dorpat. During the Estonian War of Independence university of Tartu was re-opened as an Estonian language university on 1 December 1919. With Estonian independence after World War I, the city officially became known by the Estonian name Tartu. At the end of Estonian War of Independence following World War I, a peace treaty between the Bolsheviks and Estonia was signed on 2 February 1920 in Tartu (Treaty of Tartu). The treaty meant that Soviet Russia renounced territorial claims to Estonia "for all time". However, as a result of the Nazi-Soviet Pact of 1939, the Soviet Union occupied Estonia and Tartu in 1940. Peace treaty between Soviet Russia and Finland was also signed in Tartu in 1920. During the interwar period Tähtvere neighbourhood was built, former Raadi Manor buildings started to house Estonian National Museum (destroyed during Tartu Offensive in 1944) and art school Pallas was opened. After the war, Tartu was declared a "closed town" to foreigners, as an air base for bombers was constructed on Raadi Airfield, in the northeast outskirts of the city. It was one of the biggest military air bases in Eastern Europe and housed intercontinental fighters, that carried nuclear bombs. The location itself was where the Estonian 2nd Air Division was situated prior to the Soviet occupation. The asphalt runway there now houses a large used cars market, and is sometimes used for automotive racing. Tartu Airport was opened in south of city in 1946. Besides the airport Estonian Aviation Academy was established in 1993 and Estonian Aviation Museum was opened to the public in 2002. Many new commercial and business buildings have been erected (Tartu Shopping Center, Tasku, Emajõe Commercial Center, Lõunakeskus, Kvartal etc.). Highest residential building and local landmark Tigutorn was opened in 2008. Science center AHHAA relocated to a new building in 2011 and Estonian National Museum, the new main building was opened in 2016. There are 49 members on the town council, elected by residents every four years using a proportional system of representation. The executive branch of the town government consists of a mayor and five deputy mayors. The current mayor is Urmas Klaas. Andrus Ansip, Prime Minister of Estonia from 2005 to 2014, was mayor of Tartu from 1998 to 2004. The position was later served by other politicians who eventually became ministers of government, Laine Jänes and Urmas Kruuse. All of them are members of the Estonian Reform Party, which has dominated in Tartu since 1998. Mostly known as a university town, Tartu is also a site of heavy industry. The food industry has traditionally been important for the town's economy and some bigger companies in the field include A. Le Coq, Tartu Mill and Salvest. Kroonpress is the leading printing press company the Baltic States. Tartu's historic population is presented in the following table, based on data from official censuses since 1881 and Estonian Statistical Office. Note that the data up to 2011 is not directly comparable to the most recent numbers, as the methodology of compiling population statistics has changed. Tartu is officially divided into 17 neighbourhoods, which carry no administrative purposes. Their names and borders are defined. In music, there exists the Tartu school of composition. Tartu has been an intellectual centre of both Estonia and Baltic countries for several centuries. Scholars hailing from Tartu include the pioneer of embryology Karl Ernst von Baer, a pioneer of animal behaviour studies Jakob von Uexküll, and a cultural theorist and semiotician Juri Lotman. Tartu School is one of the leading scientific schools in the field of semiotics. 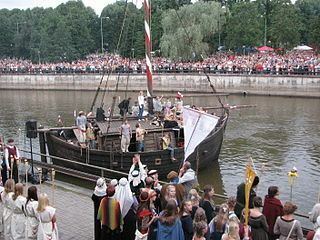 Annually, in the summer, Tartu hosts the Hanseatic Days festival (Estonian: Hansapäevad) to celebrate its Hanseatic heritage. The festival includes events such as handicraft markets, historic workshops and jousting tournaments. Tartu is the home for basketball club Tartu Ülikool/Rock, which is participating in the Korvpalli Meistriliiga, the Baltic Basketball League and the EuroChallenge. Football club JK Tammeka Tartu, one of the Meistriliiga clubs, is located in Tartu. Tartu is also the hometown of Clement "Puppey" Ivanov, captain of Team Secret, a professional Dota 2 team. He won the first International, and was runner-up two years in a row with Natus Vincere. The 2017 World Orienteering Championships will be held in Tartu. George Hackenschmidt (1 August 1877 – 19 February 1968), strongman, professional wrestler, writer and philosopher.